ADD ALL INGREDIENTS TO MEAT EXCEPT CHEESE AND NOODLES. COOK ON MEDIUM HEAT FOR 30 MINUTES OR UNTIL SAUCE THICKENS. STIR IN MACARONI NOODLES AND TOP WITH CHEESE. BAKE IN A GREASED CASSEROLE DISH ON 350 DEGREES UNTIL CHEESE IS MELTED. 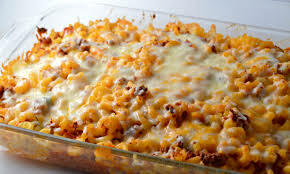 This casserole reminds me of ones my mom used to make - great memories of hearty, delicious food. Thanks for sharing! That sounds so nice and easy! I love quick and easy casseroles. I love casseroles. This one looks and sounds fantastic! Thanks for sharing at the What's for Dinner party!